The What: Hosa Technology is now shipping its latest additions to the Hosa Pro line. The new Hosa Pro Headphone Cables are designed to bring next-level durability to the final link in the audio reproduction chain. 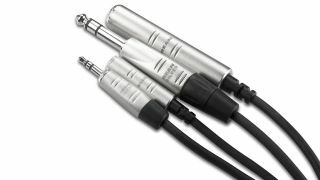 The What Else: The Hosa Pro Headphone Cable line is one of Hosa’s most comprehensive introductions, consisting of five different configurations in various length options. The HMM Series Pro Stereo Interconnect is designed to hook up pro audio headphones equipped with a mini stereo input to source audio equipment with a mini stereo output. For headphones without removable cables, the rest of the line is comprised of extension cables in every combination of 3.5mm and 1/4-inch connections. They provide additional reach between headphones and their audio source for any application from lifestyle use to personal monitoring during rigorous recording sessions. The HMM Pro Stereo Interconnect is offered in 3-, 5-, 10-, and 15-foot lengths. Pro Extension Cables consist of four configurations: 3.5mm female to male (HXMM), 3.5mm female to 1/4-inch male (HXMS), 1/4-inch female to male (HXSS), and 1/4-inch female to 3.5mm male (HXSM). All headphone extension series are available in 5-, 10-, and 25-foot lengths. The Bottom Line: Hosa Pro Headphone Cables rely on quality components, starting with 24 AWG Oxygen-Free Copper (OFC) conductors for enhanced signal clarity and 90 percent OFC spiral shields for superior signal-to-noise ratio. Each cable sports REAN connectors by Neutrik AG for efficient signal transfer and durability. These materials, combined with Hosa’s workmanship, result in interconnects designed to provide exceptional audio performance for many years.